Voskos is a brand that I had never heard of that I randomly found in the organic specialty foods section of my local Kroger one day. 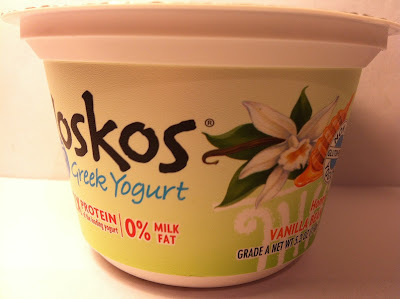 They had several of their single serve Greek yogurt products on sale, so I picked the different varieties and that leads to this review of the Voskos Honey Vanilla Bean Greek Yogurt single serving cup. Like I said, this one was on sale, so it was priced at $1.00 and the cup is 5.3 ounces of "Thick & Creamy" Greek yogurt consisting of 130 calories and eleven grams of protein. I've already reviewed the honey version of their Greek yogurt, so this one is a slight derivation of that. After I tore open the lid of the container, one thing was for sure: they were not skimping on the vanilla and vanilla bean aspect of this yogurt because the smell of the cup strongly permeated of that wonderful (at least to me) vanilla smell along with a plethora of little vanilla bean specks spread throughout the yogurt cup. I can honestly say that this cup was a bit soupier than the others that I've tried and was more like a typical yogurt as opposed to a thick and creamy Greek yogurt, but I won't hold that against Voskos in this instance. Like the previous review of the honey flavor, there was no additional honey mix-in, so I figure that is part of the yogurt flavoring. Well, if honey was part of the yogurt flavoring, it was very faint because all I tasted in this one was a strong vanilla flavor and since I LOVE vanilla, I was more than okay with that. The little specks of vanilla bean obviously amped up the vanilla flavor quite a bit. If I did taste any honey at all, its flavor came in a tiny bit of sweetness at the end of each spoonful. In fact, if I had to break down the two flavor disbursements, I would say that this cup was 90% vanilla and 10% honey. One thing was for sure though, the strength of the vanilla flavor more than cancelled out what I'll call the typical sourness of regular Greek yogurt and it was nowhere to be found. With the soupier/smoother texture, this one resembled more of a regular yogurt with its mild and cooling taste than it did a Greek yogurt and that's neither good nor bad, but just an observation. Buy It or Fly By It? I loved the vanilla flavor in this cup brought by the addition of the vanilla beans, so I'll give it a BUY IT rating. 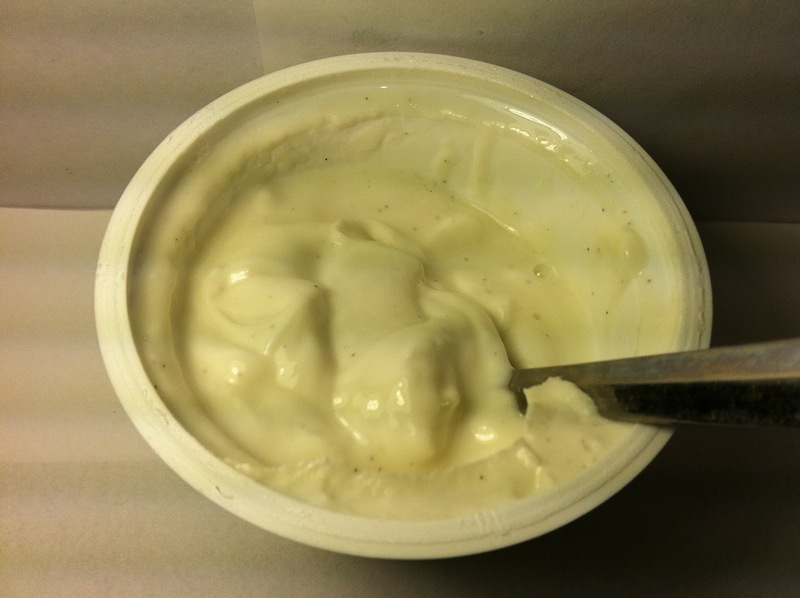 It's lack of Greek yogurt taste, while yet still having the Greek yogurt benefits (added protein, etc.) makes this a winner in my book. If you aren't a Greek yogurt person, but you want the benefits of Greek yogurt, this is a good one to pick up because you won't even feel like an Athenian at all while eating it.